We are not a morning family. Well, not unless there is surfing involved. So now that my daughter has to be at her desk at school by 8 am, I am looking for some serious ways to speed up our morning routine. That is where these breakfast cookies come in. I needed to come up with a healthy breakfast that could be prepared in advance, and eaten swiftly on school mornings. I wanted it to contain plenty of protein, some carbohydrates, and a little fat, without any added sugar. Those are some seriously good reasons to make sure your children eat before school. However, making your youngsters eat breakfast is easier said than done. 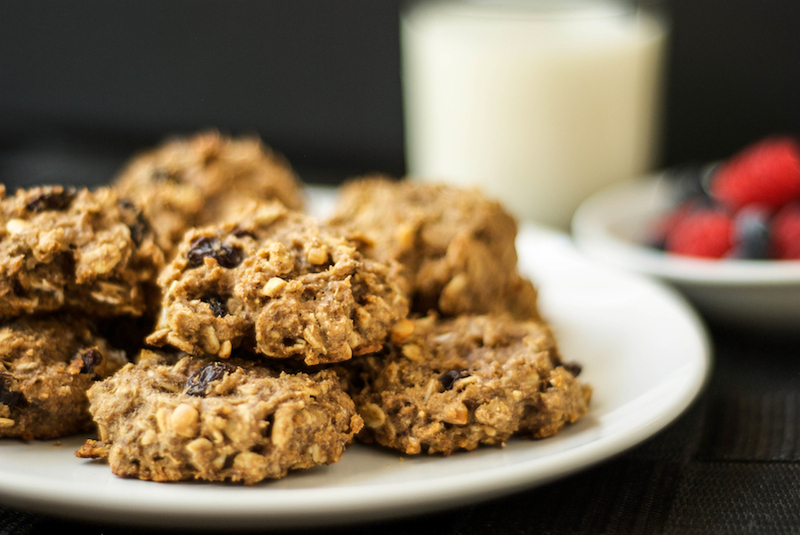 These breakfast cookies, full of banana, peanut butter, and oats, are a great source of energy for body and mind. The only sweeteners are from fruits (banana, applesauce, and raisins), but they don’t have that rubbery texture that sometimes comes with using applesauce. Plus, they have a good dose of omega-3 fatty acids from the flax seed. And because they look and taste like cookies, it should be easier to persuade your little ones to eat them in the morning. Vegan banana oatmeal breakfast cookies with peanut butter and raisins. Mash the banana in a large mixing bowl. Add the peanut butter, applesauce, and vanilla extract, and stir well. In a separate bowl, mix together the oats, flour, baking soda, cinnamon, and flax seed. Pour the dry ingredients into the wet, and mix until fully combined. Add the raisins and stir well. Form balls with the batter and place them on a parchment lined baking sheet. Press them down slightly to make cookie shapes (they will not change shape in the oven). Bake for 12-14 minutes, then remove from the oven and place on a cooling rack to cool. I hope you like it. And if you need it a little sweeter, you can always add a couple of tablespoons of honey. 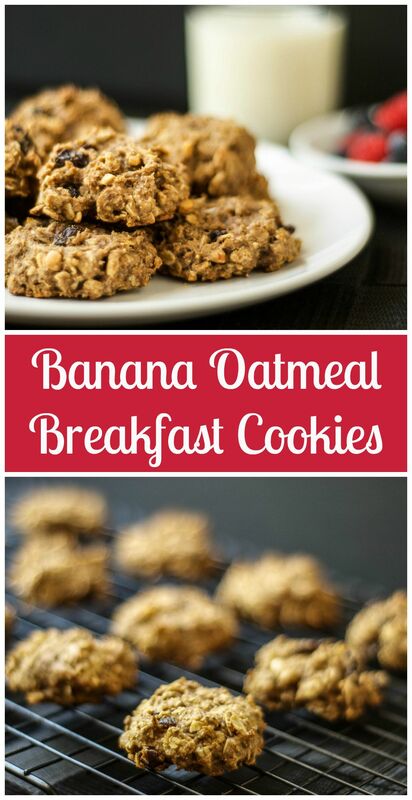 This banana oatmeal cookies look like the perfect breakfast to us! Thank for the recipe! My mum used to make similar recipes for me but this sounds better! I pinned this too thank you for sharing! This looks terrific! I’m heading to my kitchen now! I love finding recipes like this that can be grabbed on the way to school! Thank you so much for sharing this at the Healthy Living Link Party! These are great, Esther – so delicious! The ones I made were almost like sweet bread. I loved the texture. I made them with buckwheat flour because I prefer wheat free. Recommendation: make double, they are very popular! I’m glad the buckwheat worked out. Nice to know there is a viable gluten-free alternative. Thanks Rach! Must try putting some apple sauce in my next batch! I found you through the Tell ‘Em Tuesday linkup. These look delicious, and I love that they don’t have added sugar. I’m looking forward to trying them! That was my main objective – to create a tasty recipe without sugar. And my children have no idea. Wow! Thank you 🙂 I feel honored.